It's Rare Item Monday again, and you know what that means - fake rares! 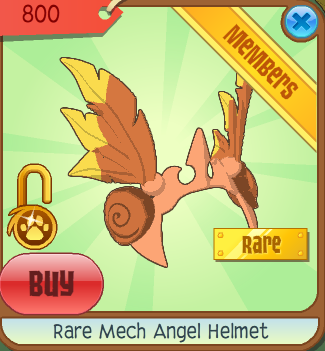 There's a new Rare Mech Angel Helmet. I'm not an expert on rares, but if I were you, I'd buy few. Sadly it's member. Maybe you can make a few low price trades, nms! May soon be known as "Orange Mech"! Looks like nobody posted on Four Stories! Well, maybe next week. Cutepanda01 (Anonymous) I deleted your comment by accident. Sorry.